It's Time For Us To Meet! 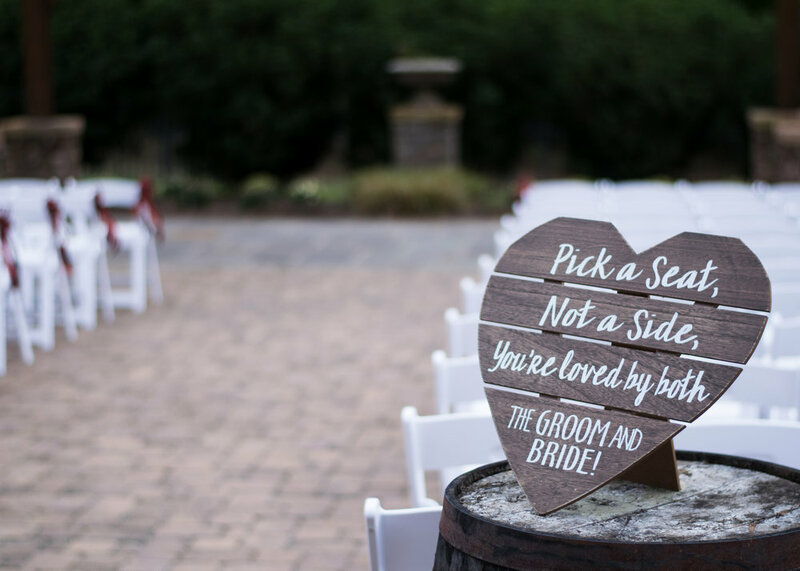 There’s nothing like a little Southern Charm to make your big day even more special! Scott and Amanda Poole were married September 29th 2017, under big blue open skies in rural Raleigh, NC. The Manor at Carriage Farm proved to be the perfect location for this couple to say their “I Do’s”, which happened to be pretty unique. Amanda had to promise to drink with him when his team wins…..and loses! Hint: Scott is a UNC Fan and Amanda is a Pirates Fan!! Pre I Do’s-Amanda could not contain her excitement as she peaked out a window watching her friends and family appear. 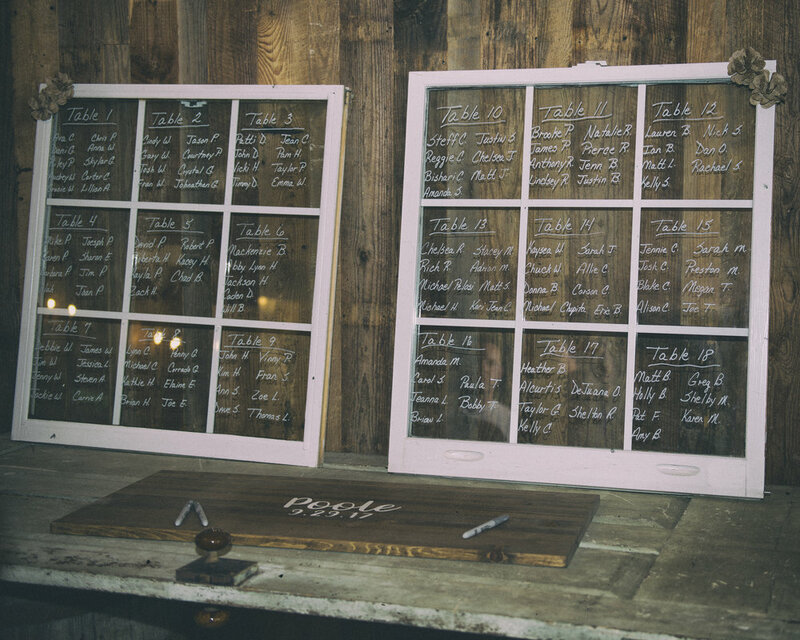 As guests arrive they signed Amanda and Scott’s Guest Book Board, which the couple wanted to cherish and hang in their home. Then each guest took their seat, as they stared in awe of the gorgeous wooden arch that the couple would soon stand below, along with the majestic house that bride made her grand entrance from. 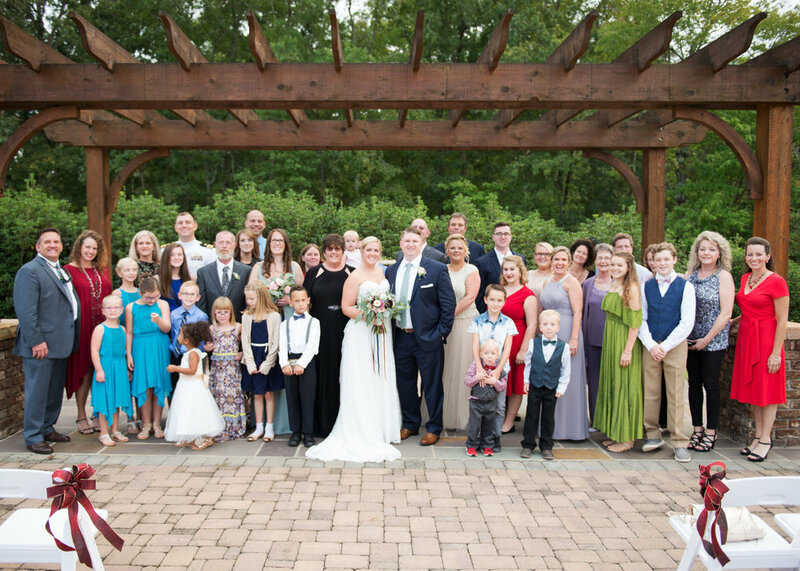 Each guest was careful not to sit in the first few rows (marked with beautiful red bows) that were reserved for their loved ones joining her on that momentous walk down the aisle. 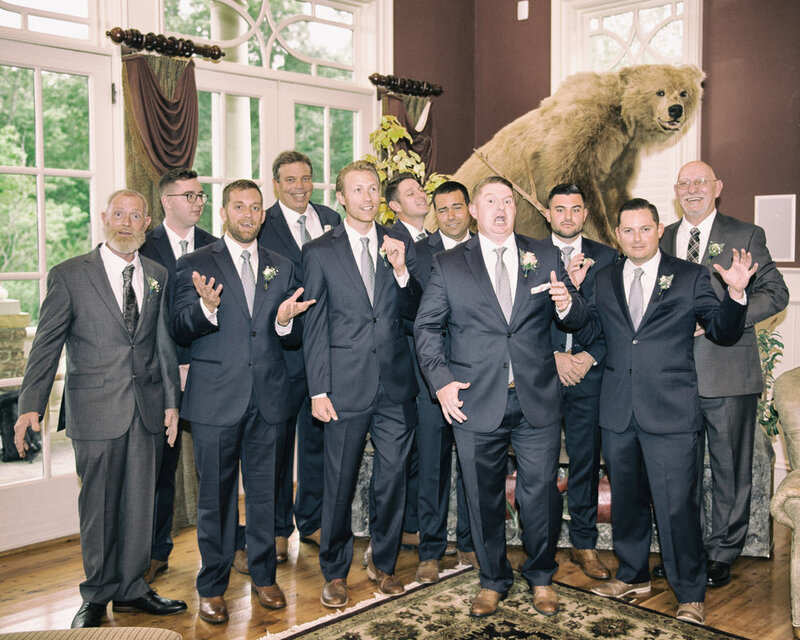 As Amanda made her way to Scott, this usually stoic man could not mask his cool exterior, as tears pooled in his eyes at first sight of his blushing bride. 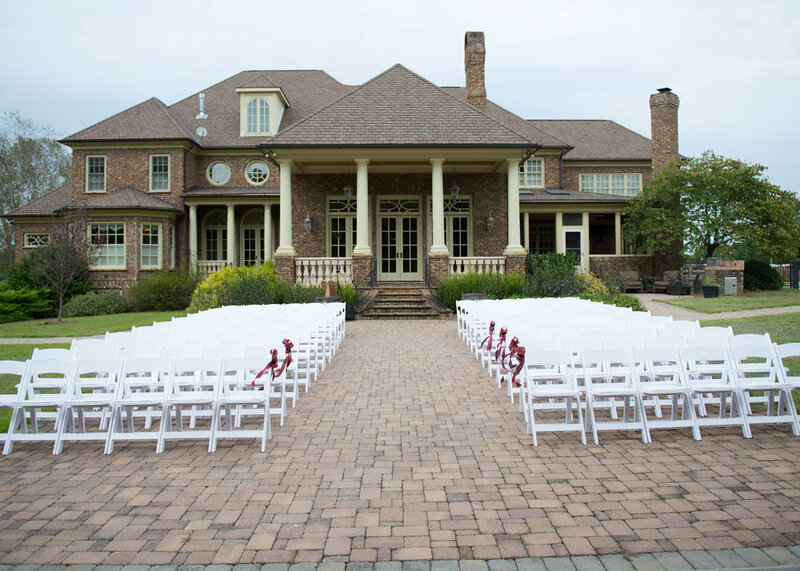 Post I Do’s- The Pavilion was the next stop on this journey, which was a short distance from the ceremony site. Guest gawked at the huge wooden beams in this newly built structure, along with its giant brick fireplace; adorned with greenery, roses, and dangling Fairy Lights. Cocktail Hour kept the guests on their toes with strong drinks and lawn games, while they waited patiently to see the newly married Mr. and Mrs. Poole. Once Cocktail Hour commenced they took note of the White Rustic Window Panes directing them to their assigned tables. Love and Laughter was had once Amanda and Scott entered, sharing first dances and speeches. Not only did everyone get treated with a delicious meal by Cook Shack Catering, but the couple's favorite desserts as well: Chocolate Chess Pie, Banana Pudding, Cookies, and of course a (small) cake for cutting! Luckily, the duo, and their loved ones, weren’t too full to rock the night away with hits by Flair DJ. As guest shuffled out of the pavilion with koozies and magnets in hand, they lined up for the sparkler send off, followed by a paper lantern lighting for loved ones who could not be with them on their special day. After a long day of love, laughter, tears; good food, tunes, and dancing, the pair were ready to ride off into the sunset. These two made a beautiful lifelong commitment to one another for all their friends and family to see, and surely will be a day that they will never forget!